I always hoped Daniel Miller would turn up at Guerilla and so it happened when he booked in to mix some live Depeche Mode tapes with producer Gareth Jones. Like Ivo from 4AD, I knew Daniel from the old post punk trenches of the late 70s-early-80s. The Lines drummer Nick Cash also played with founding Mute Records act Fad Gadget. We got on well and Daniel entrusted some of the mixes to me, and obviously liked them well enough, because my next assignment was to do a remix of this mighty track. 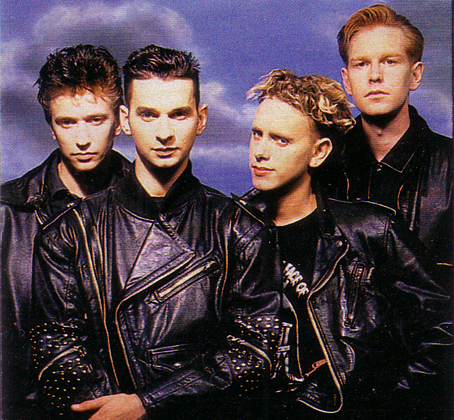 By this time Depeche were massive in Europe, their big push into the US would come the following year. Their album Black Celebration was a big leap forward in production and songwriting, and the title song in particular seemed designed to propel them into the stadium-cramming entity they would soon become. This wasn’t mixed at Guerilla, it was done at a big fancy studio in the West End of London, on the graveyard shift. Imagine some red-shirted yeoman from Scotty’s engine room having to take over control of the Starship Enterprise in the middle of the night and you might understand how I felt sitting before the 30 foot wide SSL desk with two 24-track machines chasing each other back and forth. Luckily I’d already built up a method of remixing at Guerilla which could be applied in any situation, because it involved running the desk manually, taking numerous sections “on the fly” and snipping them together as I went along. Thus a mix would only roughly be planned, it would rely very little and often not at all on automation, and there was plenty of scope for following strange side roads spontaneously. A good example of this is the hilarious section where I “scratch” the vocal by disengaging the sync between the multitracks. This mix was the beginning of an interesting couple of years working on Mute and related projects, of which more will be written anon.